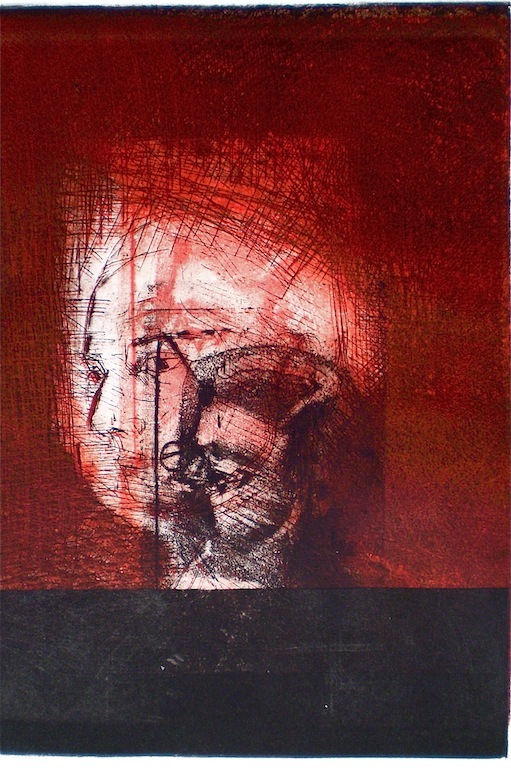 The light grey tone was the first, red second placed and registered over the grey and then the black area was printed last. 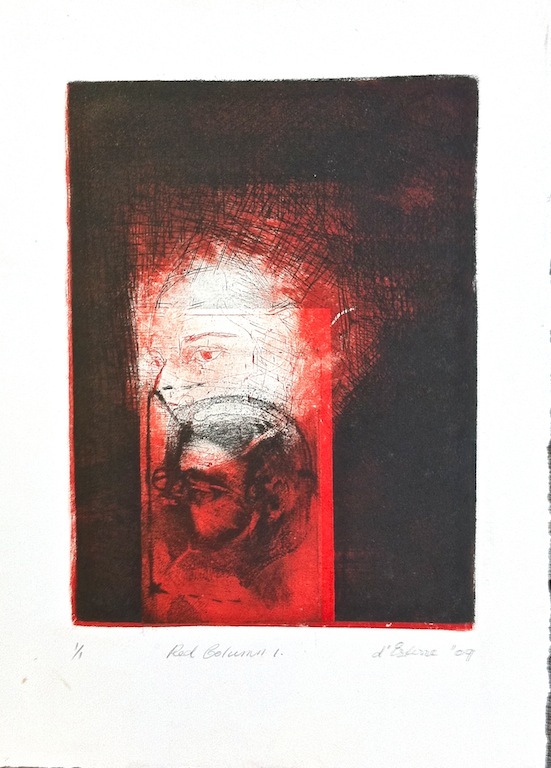 I hadn’t done a drypoint using rollers and roulettes to get tonal areas as opposed to aquatint and etching with acid combined with masking out different areas of the composition. The result, which I’m still adjusting to, is more graphic than my usually painterly look especially without any chine-colle application. 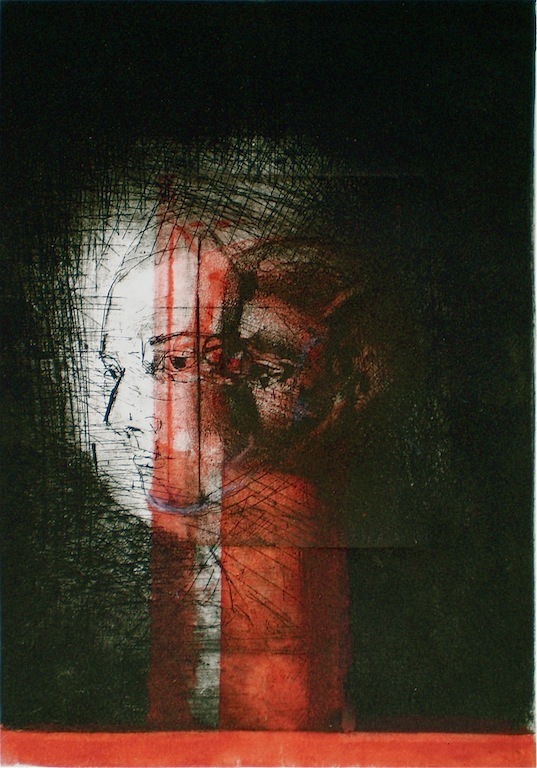 Categories: Mixed Media | Tags: BFK Rives paper, black, drypoint, Etching, Intaglio, red, white grey | Permalink. Copperplate is quite a hard surface in comparison to zinc or aluminium. I haven’t etched on copper for a while. 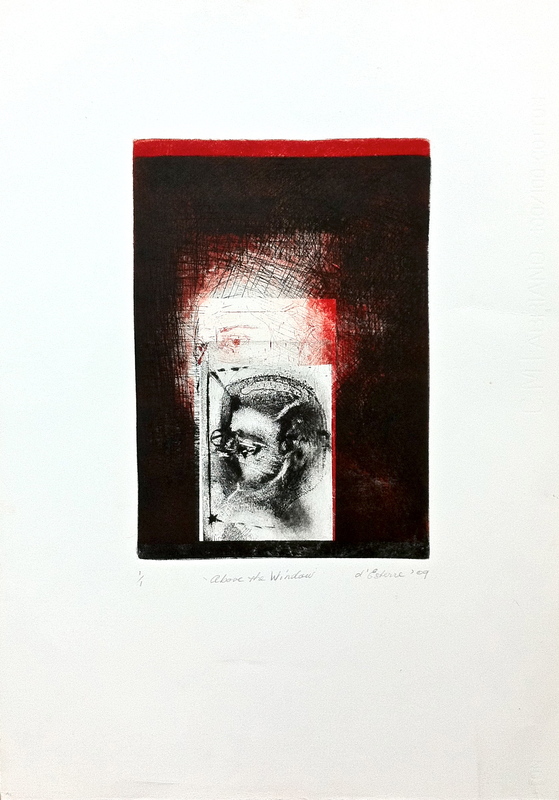 This was an old plate with an aquatint that provided me with a dark area from which I began the composition. The composition is based on an earlier work titled Maria found the “golden spike”, an oil on gessoed paper. The term “golden spike” refers to a part of the early boundary within the Flinders Ranges where 635-542 million year old fossils were found. The significance of the find led the world science community to recognise a new geological period termed the Ediacaran period. 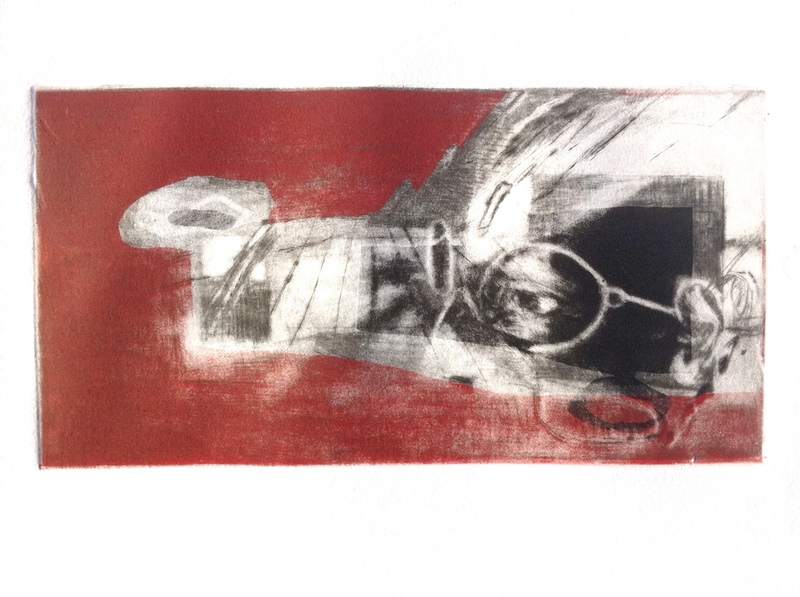 The three printed images are firstly with red ink and then I tried a black area on top of the red. In the third image I printed red over dark grey in the background making it a little too dark. I needed to have a lighter grey under the red as a base. I then masked out the areas left as white. Several attempts at a suitable base layer with trial and error. More modification with the red layer. 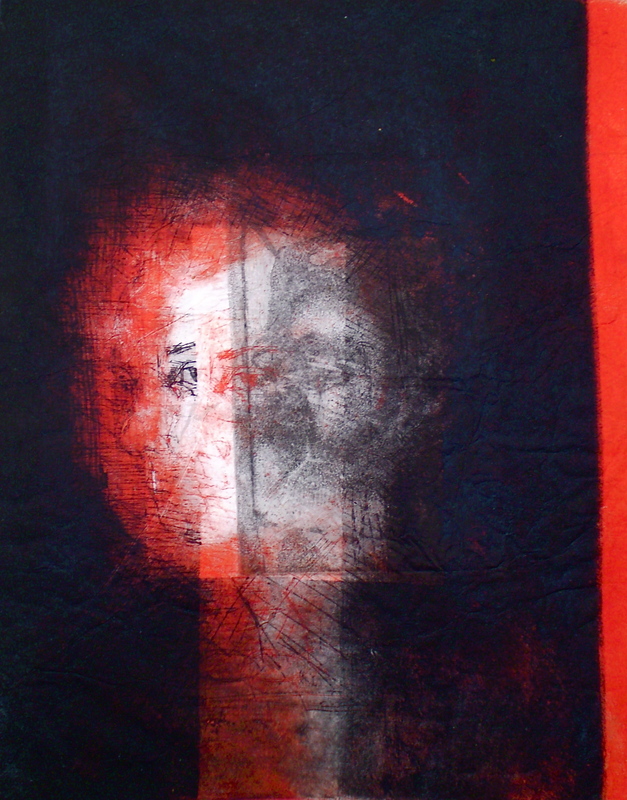 The red could be made lighter by a further lightening of the grey base layer. At this stage I’m half way through the process. 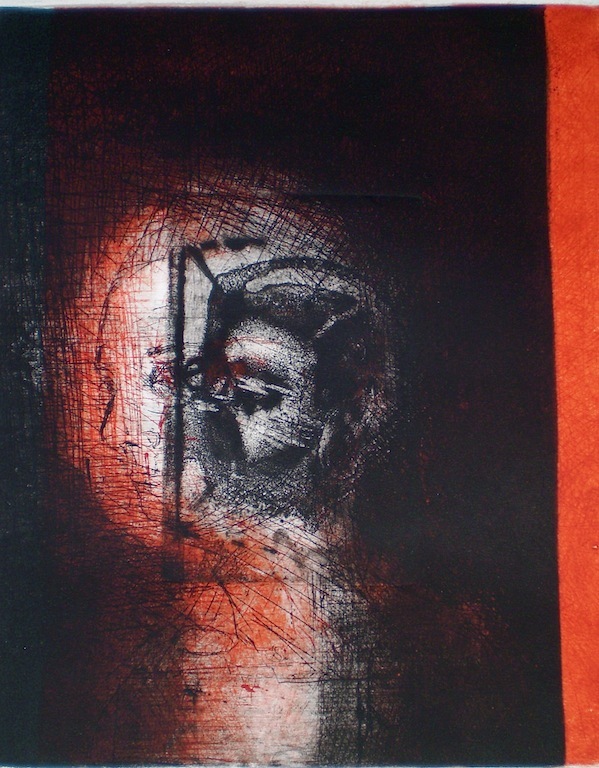 Categories: Mixed Media | Tags: contemporary etching, drypoint, Intaglio | Permalink. 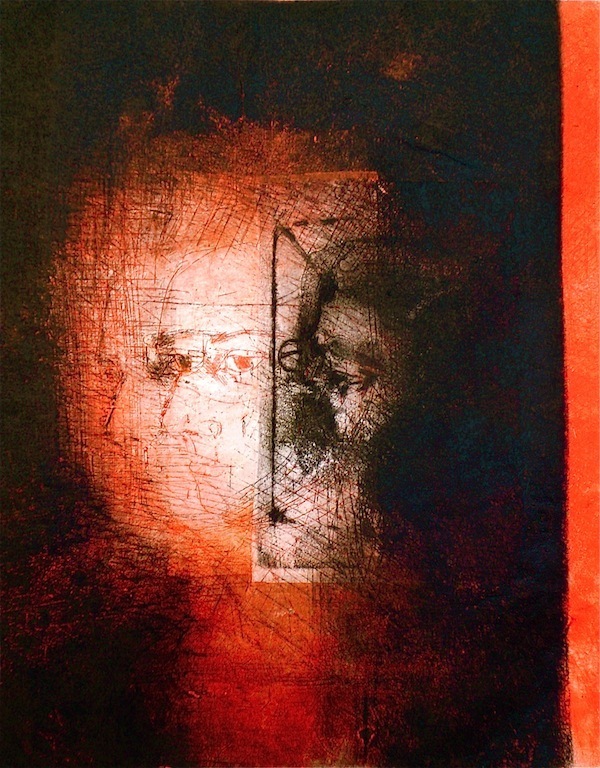 Portraits can tell a story without a long narrative structure because the artist tries to capture a point or in this case points in time within the space of one image. The image is still but it alluded to action and thought. I tried to capture some aspects of the mother and daughter relationship at a time when the mother’s influence waned and prominence of the peer group and the daughter’s sense of identity took the stage. The abstracted shapes like the keyhole and window referred to elements of vision about elucidation, obscurity and transition. The red column shape echoed those in ancient Minoan rituals that depicted aspects of female initiation. 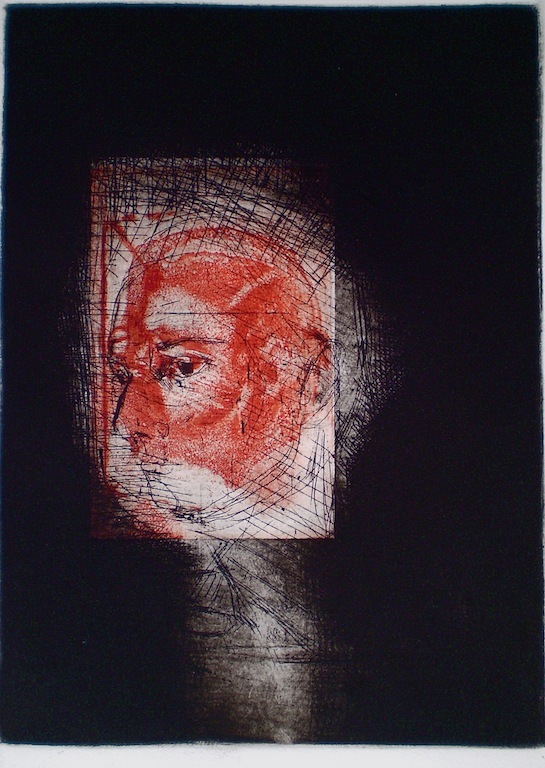 The title of the series to which these prints belong is Natalie with the Gaze and the Glance, 2009 – 2010. 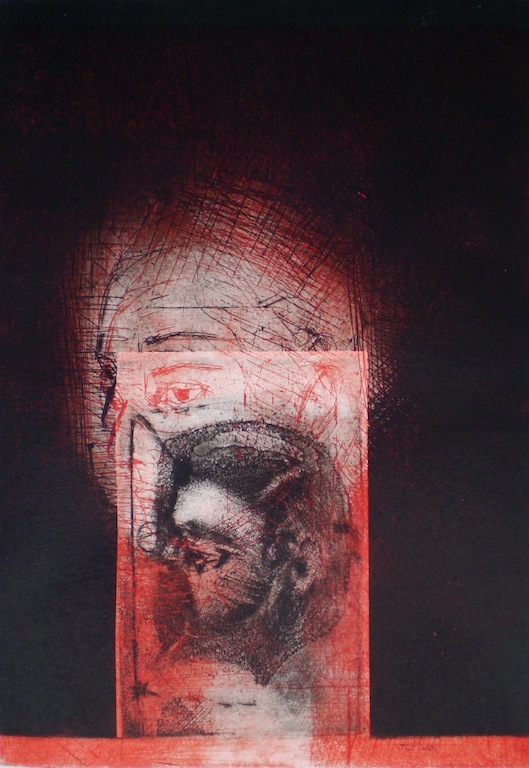 The Keyhole Image 2, 1/1, 2009, intaglio and drypoint on rice paper. 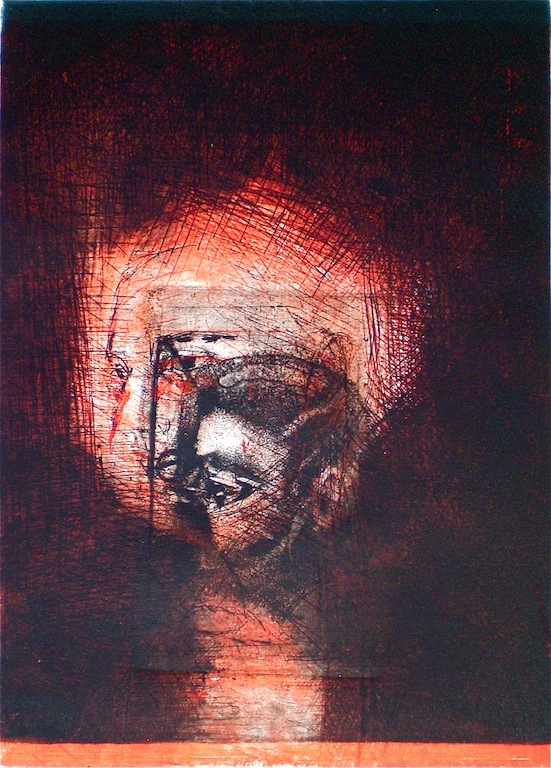 Terms “gaze and “glance” referred to modes of seeing by artists, the first produced a structured work arranged in layers where underneath paint layers were gradually obscured until attainment of the desired effect for example in European oil painting. On the other hand the glance mode was more immediate and brush work encapsulated the image in one layer as in Oriental brush painting. 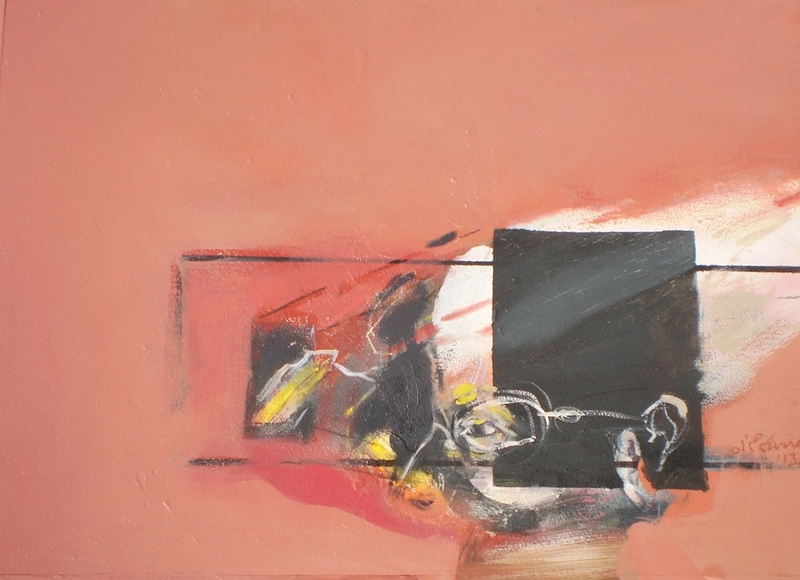 I integrated both ways of seeing into my compositions. 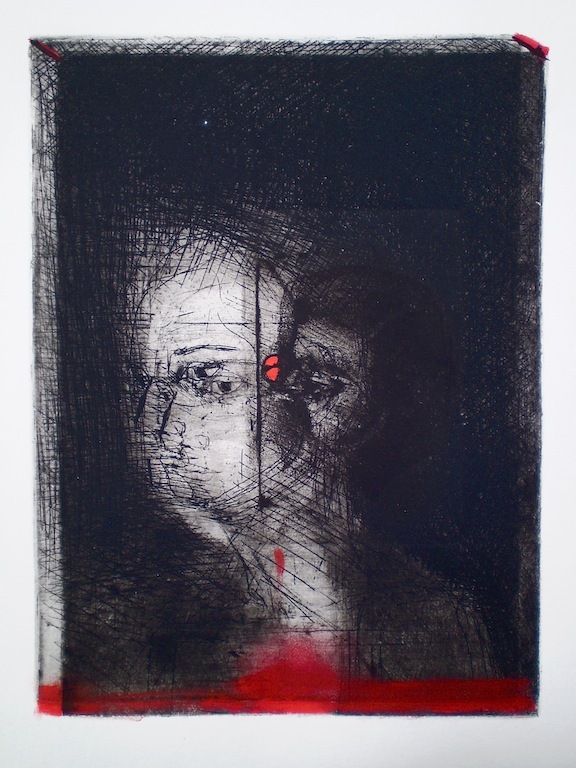 In earlier blog titled Line drawing with faces and figures I discussed styles of line work and printmaking. 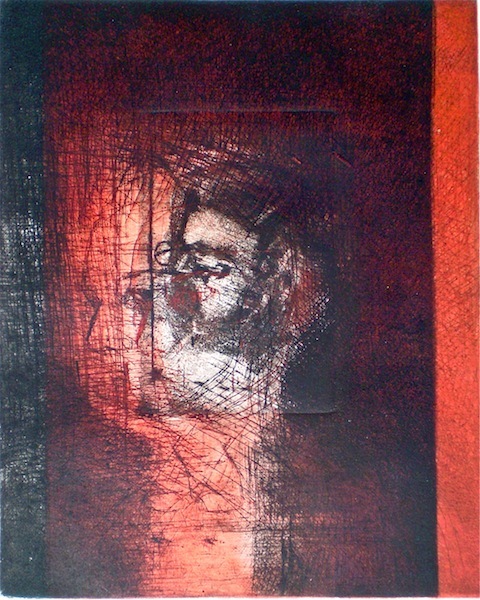 Categories: Prints | Tags: black ink, drypoint, Etching, Fabriano, Intaglio, portraits, red ink, rice paper | Permalink.